"Identifying the trigger for canine ear problems can be frustrating with possible multiple causes including infection (bacteria, yeast, mites, fungus), allergy (atopy, food), water (swimmers ear), foreign objects and tumors. Symptoms include head shaking, rubbing the ear against furniture, head tilting and ear scratching.There may or may not be inflammation (called otitis), red skin or itch. Dogs with advanced cases may appear wobbly or lethargic and act in pain when the ears are touched. Treatment includes medicated drops and possibly antibiotics with most dogs showing improvement in several days with complete resolution of the problem in 2 weeks. Some cases can be frustrating and require multiple tries before the right approach is identified. If it is a frequent problem check if hair is blocking the ear and try a supplement such as natural drops." The most common canine ear problems are excessive ear wax build up, ear mites (Otodectes cynotis), dog ear hematoma and ear infections. Infections may be bacterial or fungal, and may be limited to the outer ear (otitis externa) or may also include the middle ear (otitis media). Allergies can also be the cause such as Canine Atopy or yeast infection. Some dog breeds are more susceptible to ear problems than others. For instance, dogs with hairy inner ear flaps, like schnauzers and miniature poodles, are prone to heavy wax build up and infections. If the cause is due to a tumor or abnormal cell growth your dog could be suffering from dog neoplasia. Otitis is the term used to refer to inflammation in the outer, inner and middle ear (externa, interna and media respectively). Chronic otitis is diagnosed when inflammation lasts for more than 1 month. If dog ear inflammation happens frequently, as is common in some dog breeds, then a veterinarian will recommend routine ear cleaning as a preventative measure. Inflammation in general is often difficult to diagnose with many veterinarians referring patients to a dermatologist. Outer Ear: Consists of the ear canal and the external ear flap. Area where sound vibrations enter from the outside world. 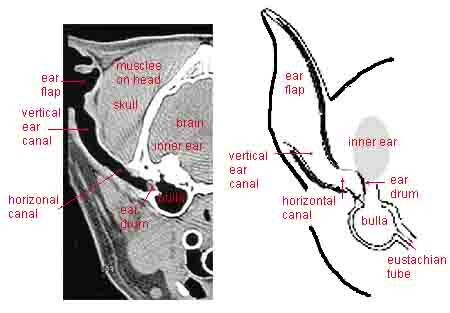 The outer or external ear is formed by two pieces of cartilage and a bony skin covered canal. It ends at a structure called the typanic membrane. the outer ear canal is between 5 to 10cm in length and is divided into horizontal and vertical portions. Middle Ear: Contains the auditory ossicles and the eardrum. The ossicles are the small bones that transmit the eardrum sound vibrations to the inner ear. Inner Ear: Contains the cochlea, which houses nerve endings that receive sound vibrations and pass nervous system signals along to the brain. When a dog scratches an ear, it can cause canine ear problems such as tears and bleeding between the cartilage of the ear flap and the skin, a condition all hematoma. 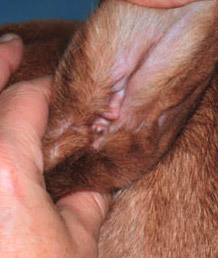 Symptoms include an ear that causes pain for the dog, and that is warm and swollen to the touch. 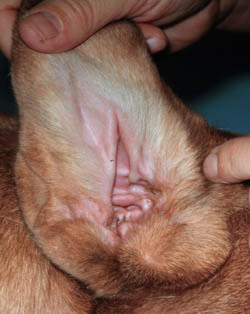 In a healthy canine ear, the inside of the ear should be pink with the possibility of a little black discharge. found in 1 in 10 normal ears. Bacteria is also present in very low numbers. Canine ear problems are usually easy to diagnose, although some cases of canine ear problems that involve inflammation can be a challenge. Your vet can often diagnose them simply by looking into your dog's ears. To confirm the type of infection, your vet may use a cotton swab to take a sample of the wax or discharge from your dog's ear and look at it under a microscope. If the ear problem looks like a pimple or a tick on the ear, review our guide on dog ear blisters. Partial or complete hearing loss in dogs is one of the canine ear problems that can be passed on genetically or be caused by a disease (called acquired deafness). Even healthy parents can pass on hearing loss to a puppy if the parents are genetically disposed to the condition. The condition is diagnosed using a BAER test (Brain stem Auditory Evoked Response). The most common cause is external ear canal disease called otitis externa, which is the result of an infection that progresses into the inner and middle ear. When the ear canal gets filled with was, pus or mite debris, the sound waves do not reach the eardrum in part of completely. This reduces a dog's hearing to some degree. This is why hearing loss in some dogs can be to varying degrees. 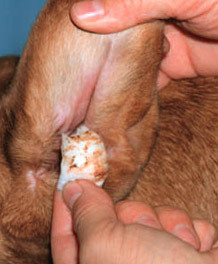 In some dogs, after wax and debris is removed, hearing returns. If the dog ear disease is allowed to become chronic, the eardrum can be breached, leading to inner ear disease and permanent impaired hearing. As you imagine, hearing loss due to disease is gradual and worsens as the infection develops and causes damage. Other causes of hearing loss in dogs is called Ototoxicity, which is ear poisoning. In this condition, a dog that is exposed to certain medications (antibiotics, ear cleaners, chemotherapy) or chemicals (household chemicals) can suffer from damage to the inner ear or the nerve that sends balance and hearing information from the inner ear to the brain. Some effects might be reversible if the hearing loss is quickly identified and addressed. Age related hearing loss is due to some degeneration in the inner ear. This can occur with or without the presence of an infection. The key is to avoid canine ear problems such as infections in the first place. When your dog is healthy, it is generally recommended that you clean or check the ears weekly. This will help prevent wax build up. Ask your vet for a cleaning solution. 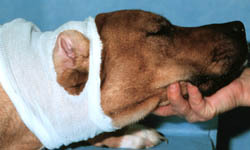 Dampen a gauze pad with the solution and wipe the inside of your dog's ear. Don't use cotton balls as they can leave behind wisps of cotton inside your dog's ears. Clean his ears as far as you can reach. Your vet can demonstrate the procedure for you. If your dog has ear mites, his ears will need to be cleaned with a special dog ear infection medicine medicated solution. 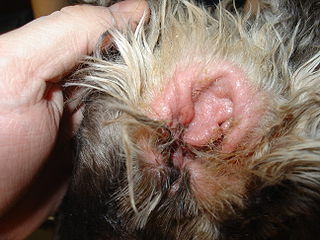 Usually only one cleaning is required and your vet will do this when he or she diagnosis your dog with ear mites. If additional cleanings are required, your vet will show you how to do them. If you believe the mites are from the environment surrounding your dog, continue cleaning the area with Benzarid. If your dog has an ear infection, he will need antibiotics. These will come in the form of pills that you dog will need to take for 10 - 14 days. Clean his ears daily during this time. Your vet may give you a medicated solution to clean his ears with, and may also prescribe medicated ear drops. For small dogs with an ear infection a regular sock can be used to hold the dogs ears back or for larger dogs you can tape them together to help air flow. Clean the ears in an area that is easy to clean such as outdoors or in a bathroom that has a tiled floor. Start by flooding the ear with a cleaning solution made for dog ears (1/2 to 1 teaspoon). Follow your veterinarian's or manufacturers instructions, which usually calls for flooding the ear (vs. only using a few drops). The ear cleaning solution should remain in the ear for 60 seconds. Gently massage the base of the ear to loosen any debris. When done, use a cotton ball to remove the debris (only with real cotton balls, not synthetic). DO NOT USE A Q-TIP since this can push debris deeper into the ear, or it can puncture the ear. If you do use them, do not go past the point at which you can see. Squeeze the dog ear wash into the ear canal. Also apply several drops to the inside of the ear flap. The bottle needs to be inserted only a few millimeters into the ear canal. Do not force the bottle tip into the canal. Also do not forcefully squeeze the bottle in order to avoid damaging the ear drum from the force of the liquid entering the ear. Be gentle. To spread the dog ear cleaning solution in the ear canal, massage the ear base. Repeat the cleaning process 2x a day for 1 to 2 weeks. The process can then be 1x or 2x a week once the condition has been brought under control. If you see just a bit of tan or brown wax on the external ear canal, wipe it away with a cotton ball dipped in ear cleaning solution or hydrogen peroxide. One of the simple things you can do to help with canine ear health is to keep your dog's hair from blocking the opening of the ear. Plucking a few hairs to allow good air flow into the ear with help prevent infection. Regular ear cleaning can also be helpful. When choosing an ear cleaner, avoid products that contain alcohol since this can be irritating and instead look for one that is similar to Dermapet. Tea Tree Oil: soothes and reduces inflammation in the ear as well as treat any bacterial, fungal or mite infection that is present). Rosmarinus officinale (Rosemary): topical pain reliever and antiseptic/disinfectant herb. Several of the compounds in rosemary have also been shown to have anti-inflammatory effects. Calendula officinalis (Marigold): herbal ingredient used to treat skin problems and promote healing of wounds. It is an excellent anti-inflammatory and prevents infection with its anti-bacterial, anti-viral and anti-fungal properties. Marigold has been shown to assist the regeneration of damaged skin tissue. Verbascum thapsusis: anti-inflammatory and antiseptic herb. Good for healing of skin when applied topically and has a long history of use for ear conditions and in ear drops. The key to treatment of canine ear problems is early detection, so if you suspect a dog ear problem bring your dog to the vet as soon as possible.